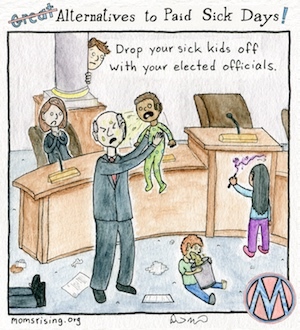 Philadelphia could be the next city to win paid sick days! Here's the sobering truth of what's at stake: For a family without paid sick days, just 3.5 days of missed work because of illness is the equivalent to an entire month's groceries for the average family. That's bad for families, and it's bad for the city's economy. PathWays PA has been leading the charge for earned sick days in Philadelphia since 2010, and recently served on the Mayor's Task Force on Paid Sick Leave. Join MomsRising and PathWays PA by raising your voice and sharing your thoughts with Philadelphia City Council members! 1/23/15 - NEW DATE! Join us on February 3 for the Hearing on Earned Sick Days in City Council!